Introducing a new piece of hardware - uAmp or "Micro Amp"
At the basic level, the Micro Amp is a signal conditioner / amplifier which can be used with any square wave data source. The uAmp has been designed using the same MOSFET drive technology as the uSC and has some of the same design features such as built in strain relief holes, basic board comes pre-assembled and ready to use, pre-formed holes for optional LEDs (indicating 'power' and 'data out'), compact size, ESD protection and short circuit protection on the data line. Unlike the uSC, the uAmp is solely a digital signal processor. It has no PIC chip and is not capable of differentiating different 'channels' of data the way a string controller does - it simply processes, clarifies and amplifies ANY data fed to it. Conversely, it is a simple 'plug-n-play' device. No PIC programming, firmware, channel setting, etc is required. This example shows the data output of an SSC in blue (which is also used as the input for the uAmp). Instead of a clear 5V square wave, the data shows substantial 'ringing' and only averages barely over 3 volts at the top of the square wave. 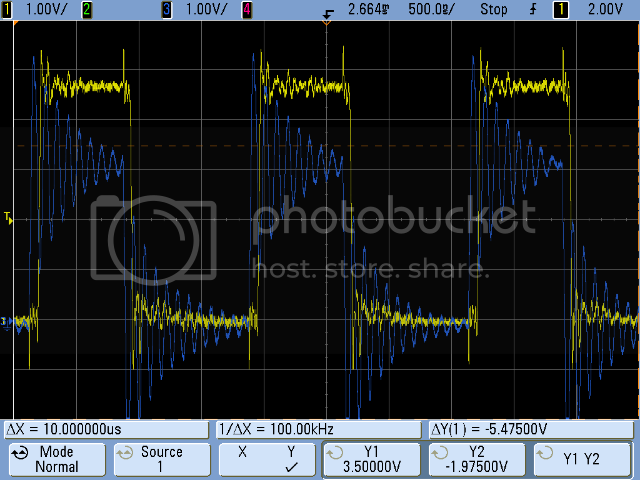 The uAmp is capable of clarifying this data and boosting the signal to nearly a full 5 volts as shown in yellow - which is the uAmp output). Ringing is substantially dampened and the square wave data shows crisp on/off transitions. If you wish to send data from an unmodified SSCV1 or SSCV2 more than a few inches, or an SSCV3/V4 more than a few feet, a uAmp can be added to the output line. Once installed, the low power, 'messy' SSC data is amplified and clarified so the controller can now be 50, 60, 70 or more feet to the display element. "Null Node" - Data transmission between nodes is limited to around 6-15 feet (regardless of string controller*). Installing a uAmp after a node will condition and boost the data signal strength so gaps between elements can be 50, 60, 70 feet or more if needed. Because the uAmp processes data and does not use the "take one and pass it on" format a node does, the uAmp does not need to be programmed into the display as a null node does. *Note - The data stream is regenerated and retransmitted by each node. Due to this a controller with a strong output (such as the uSC) can send data quite a far distance to the first node, however, when that data is retransmitted by the first node, the distance is again limited to around 6-15 feet. "Multiply" a single data stream - Since the uAmp has very high input impedance it does not put considerable load on the data line so multiple uAmp boards can be added to even a weak data stream. If you wish to have multiple display elements showing the exact same data/colors, multiple uAmps can be tied to the same data stream. Each uAmp will then deliver its own high power data stream for use with display items. You would not need to use a separate uSC or SSC for each element, though you may need to take appropriate measure to insure adequate power delivery for the nodes. I expect the cost to be around $4 in quantities of ~100 or so, though as always , larger quantities in a co-op could reduce that price. Please use this thread for any thought, suggestions, or questions and we will see if there is enough desire to put this into a production run. Great design. I think there is a big need for this design. Here is one of many use case scenarios. You have an F16 that you are running 14 strings from to a high density device. You want to run two strings or elements 60 feet away to use other ports but do not want to get a hub or put another controller where the two strings are. the simplest solution is to be able to use the two remaining ports. So with this is mind I have a couple questions and maybe this is another product. 1) Can uAMP condition two lines of data as an option for people that use 4 wire pixels? 2) Can the hole spacing on the input side be 3.5mm centers so the user can put in a four pin header and screw right into the 4 pin pluggable connectors on most controllers. I know question 2 would make board larger but it would be great to have the option to remove the wire between pixel port on F16v1, F16v2, E682 and the like. 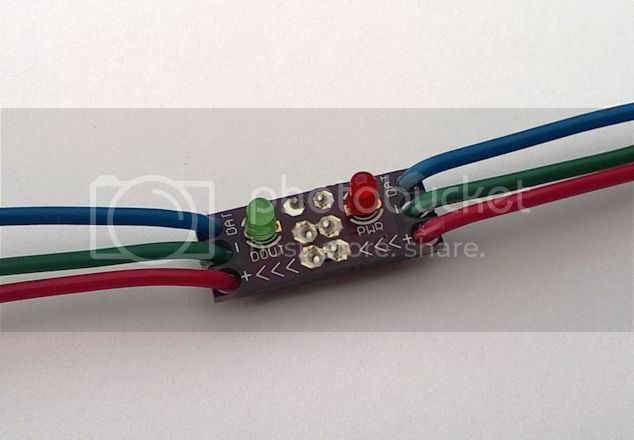 this set up for 12v system can it be use for 5v pixels ? Man could I use these in my display!!! I do agree with David and his senario. Awesome Corey! it would be nice if this was integrated with the newer falcon16/8 and uSC boards -- is that something you'd like to see happen? I also wonder about the impact on 5v strings and boards. is this something that would equally be effective on SanDevice and other smart string controllers? ...Zeus? Any reason not to use these mid-string to boost the signal (instead of null pixels) between elements like window frames? can you cascade these to double, triple or even reach further than 50ft? For long distances this is AWESOME! For short distances utilizing a SSC, would your Warp_Drive modification do the same trick if the distance from controller to first node wasn't an issue (less than 6"). I am mesmerized with the ingenuity of some people, way to go Corey! I can definitely see some uses for this in my show and I would be in on a group buy. So by theory these would work with pretty much any protocol, e.g. tls3001 chips, ws2811 chips, any other ones? Great idea. I would be in for some, it would save an extra uSC and cable run in some places I have planned for this year. This is perfect for a project I'm working on to remove null nodes. Ill be in for some. Awesome! I would definitely be in on a group buy. I would be in for a few. Count me in for some. I am in as well. Nice to see others interested as well. This year I gravitated away from hubs and SSCs to F16/Zeus for all my ground elements and it went so well that I would like to do the house but there was the distance issue. Now there is an option! Really like David's suggestion as to the connector header spacing for older controllers (3 pin tho right?) and Steve's idea to implement the circuit into new designs. Seems like 50’ should be the new standard. Right now, uAmp only processes one data stream per board which is compatible with all our '3 wire' pixels…TM1804, 1809, WS 2811, 2812, INK 1002, 1003, etc. It could be modified to support two data streams, though I was under the impression the vast majority of nodes/controllers were of the 3 wire variety. Not sure which way the economics tip...add additional cost/size to every uAmp for support of two data streams, ask a user of the more rare 4-wire pixels to purchase two uAmps, or eventually develop separate one and two stream versions. I suppose the input spacing could be anything we want - can you give me a link for one of these 4 wire controllers, I have not personally used one. uAmp should be compatible with 5V systems. The uAmp operates as a 'pass through' for whatever voltage is supplied and would have the same 5-16V operating range as a uSC, so if added after a 5V pixel or controller, it would simply pass that 5V along. I think the voltage drop is a little more critical with 5V systems, so you may reach a point where you can transmit data further than the voltage. uAmp should be equally compatible with other string controllers, F16/F8, Zeus, etc. It does not care where the data comes from, or really even what format the data is, it simply processes, clarifies and amplifies what it sees at the input. There is really no need to use the uAmp with a uSC as the output of the uSC is already up to the same power/clarity as the uAmp. I suppose you could cascade for further distances. For discussion purposes, I’m saying "50 feet" as a good number which should be obtainable in most any circumstance. On the test bench, voltage drop on the power line seems to become an issue before loss of data integrity does. I will post a bit more on this subject as I complete more testing. Since the nodes work on a digital signal, as long as they can read the data signal they work just as well… and they either can read the signal or they can't. (ie, not like an old analog TV where the picture slowly fades to snow/static). If using an SSC with Warp Drive, data transmission should be solid to 6+ feet with no problem. You would not need to use the uAmp in that instance. If you need to go further, you could either add the uAmp 'instead of' or 'in addition to' the Warp Drive mod. uAmp will process the signal equally well in both cases. uAmp should work equally well with any node using the standard 5V data line. This would include anything driven from an SSC, Zeus, F16, F8, (technically a uSC), etc. Admittedly, I’m losing track of all the new nodes coming into existence! I say 'technically' on the uSC because, as above, the output of a uSC is basically equivalent to that of the uAmp, so you're not really gaining anything.